Buy 1 day London Pass and save yourself up to £40 in cost to top London attractions. Are you in the USA, Canada, Europe or indeed anywhere else in the World? Get your London pass shipped to you or collect from the London office. The choice is yours. London Pass. Saving you money on Top London Attractions. London is Europe's most expensive city. True. But it offers excellent and great historic and educational sightseeing opportunities that nobody should miss. With over 200 galleries and 300 museums, London has a lot to offer to even the most rabid of tourist! Many many London attractions are free to see. A significant number of other attractions require you pay per entry. The cost could quickly stack up leaving anyone feeling the effect. That is where the London Pass comes in. Are you visiting London for a day? Then the 1 day London Pass could save you up to £41 off the cost of seeing attractions for that day. 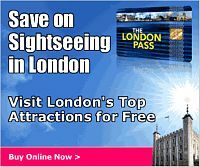 If you are visiting for two days, you could get the 2 Days London Pass and save even more, and if you plan to see London for up to 6 days, get the 6 Days London Pass. You can buy 1 day London Pass online here. This can be purchased up to 12 months prior to use. Click here to buy your London Pass. You can save even more money and time with an option to add a travel card, meaning you can travel in London Buses, The London Underground, Boat Services and other London Public transport for no additional cost for the duration of your London Pass and Travelcard. The 1 Day Adult Pass with Travel Card option cost £58.00 while the 1 Day Adult Pass without travel card option cost £49.00. For children under the age of 15 it costs £37.00 and £33.00 respectively (prices quoted here could change with time. Please see latest price here. When you buy 1 day London Pass, you get access to over 60 top London attractions for a day. A day here is NOT a 24 hours, but one calendar day. That is, if you buy a 1 day London Pass for, say Monday December 3rd 2014, you can only use the one day London pass from 09:30 hours till close of working day on that day. Discounted special offers at over 40 selected top restaurants, theaters, shops and leisure centers including the famous Harrods in London. With a one day London Pass, you can get free access to over 60 sightseeing places in London. Some of these places are actually free to visit as mentioned above. If you plan carefully, you should use your one day London Pass to visit those attractions that needs paying for, and then come back to visit the free attractions. The truth is that you can hardly find time to see more than three to to six of these paid for attractions in a day. Each of these attractions usually cost about £9 to £24 gate entry fee. With your 1 day London Pass, bought at £49.00, you can enter all the above attractions (up to a "purse value" of £90) and many many more for free, as well as get discounts on Harrods shopping, and over 40 other shops in London! No wonder it is smart to buy 1 day London Pass for a short visit to London. Remember, London has a lot to offer in sight seeing. Getting a London Pass, though seems rather pricey, is a great way to save on the cost of seeing London.